The sign that the inconscient is on the way to becoming conscious. 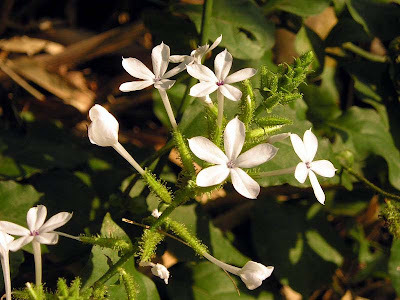 Small white salverform flower with five widely separated lobes and a thin corolla tube, set in a conspicuous tubular green calyx covered with bristly hairs; borne in moderately dense spikes. A scandent evergreen shrub with somewhat angled stems. 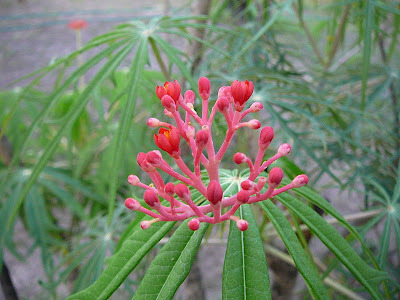 Tiny red or deep pink flowers with five separated rounded petals and a reddish pink stalk; borne in compound cymes. A medium to large shrub with large palmate leaves having eight to twelve deep lobes.